Three new picture books in the Good News for Little Hearts series help us coach children through difficulties and point them to Christ. 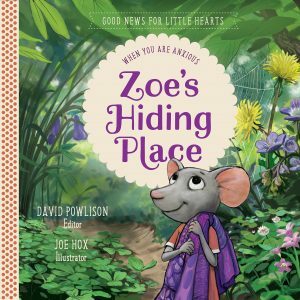 Zoe’s Hiding Place: When You Are Anxious (Good News for Little Hearts) edited by David Powlison and illustrated by Joe Hox. New Growth Press, 2018. 32 pages. 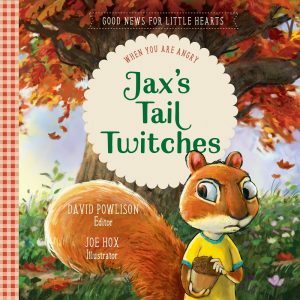 Jax’s Tail Twitches: When You Are Angry (Good News for Little Hearts) edited by David Powlison and illustrated by Joe Hox. New Growth Press, 2018. 32 pages. 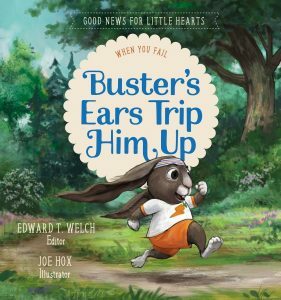 Buster’s Ears Trip Him Up: When You Fail (Good News for Little Hearts) edited by Edward T. Welch. New Growth Press, 2018. 32 pages. Zoe would rather stay under her safe, purple blanket and read fairy tales than go back to the museum where she got lost last year. Jax’s tail twitches when he gets angry, just like his father’s does when he gets angry. And Buster’s beautiful rabbit ears turn out to be more of a hindrance than a help during the long-awaited camp race. What should we do when we are anxious? When we are angry? When we fail? These are questions that plague even the youngest persons in the family, even before they can clearly articulate them. The Christian Counseling and Educational Foundation (CCEF) has created the Good News for Little Hearts series to help parents (and teachers) help our kids when they struggle. Rather than offering answers that depend on our own effort (such as mindfulness or counting to 10), these picture books point readers of all ages back to God’s Word and our hope in Christ. Books-with-a-message always sound like, well, books-with-a-message. The point of these picture books isn’t to pretend that there isn’t a message; rather, these are picture books expressly designed to help young children “see” the message more clearly lived out in the story. Illustrations are clever and include details children will enjoy pointing out (look for the recorder in Buster’s Ears, the wallpaper and “Bless This Nest” sign in Jax’s Tail, and the perspective details like a ruler in Zoe’s Hiding Place). The real strength of these picture books is in the modeling for parents: in addition to seeing how a parent might help coach a child through various situations, clear steps and further directions for parents are included in the end matter. Additionally, there is a page of Bible verses to cut out and keep in the back of each volume (each volume’s page has different Bible verses). These books would work equally well as part of a family devotional setting or in a Sunday school or traditional school classroom. Hopefully, they’ll prompt discussion and offer real hope. What are some of YOUR favorite resources to use for helping disciple young children? I’m really glad to know about these, thanks for pointing them out! It’s always a pleasure, Elizabeth–we love sharing books!